MOSCOW, November 16 — RIA Novosti. Air Show Airshow China, which is attended by more than 350 companies from 35 countries, will shut down on Sunday in the city of Zhuhai. Introduced in China, the Russian exposition was the third largest after China and the U.S., it became a hit combat training aircraft Yak-130: it intend to acquire the Philippines, the list of potential buyers as Bangladesh, Vietnam and Malaysia. Air Show Airshow China 2012 held in Zhuhai (China) from 13 to 18 November. The exposition has been deployed in three pavilions area of 50,000 square meters and at the static of 410 thousand square meters. Inside, attended by more than 350 companies from 35 countries. The largest exposition introduced China — 169 firms. Well-represented by the traditional exhibitors: 42 companies from the USA, 35 — from Russia, another 23 — from France, and so on. The range of helicopters of the Russian exposition was presented military intelligence model Ka-52 multi-purpose light — Ka-226T, one of a kind car transport and combat Mi-35M military transport workers Mi-171SH, and thus lifting the world Mi-26T. On the stand of the United Aircraft Corporation (UAC) were present model of Su-35, Su-32, Yak-130, SSJ 100, MC-21 and BE-200. 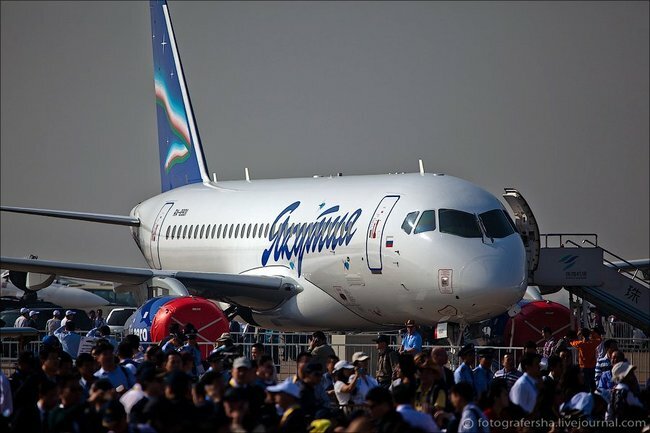 On static air show visitors were able to see for the first time with a regional airliner SSJ 100 in the livery of the airline "Yakutia" — the only full-scale exhibit of the Russian exposition for which the exhibition was the debut in China. The head of the KLA Mikhail Pogosyan said that Russia intends to show at the next show in two years a new combat aircraft Su-35, the company intends to bring to China a full-scale model that will fly. The undoubted hit of the Russian exposition at Airshow China 2012 has a combat training aircraft Yak-130, although the full-scale model cars has not been submitted. Interest in acquiring the "Jacob" expressed Bangladesh, Vietnam, Malaysia and the Philippines. According to the Russian delegation at the air show, the official proposal on the Yak-130 has received so far only from the Philippines. "They liked our cars, Russia will participate in the Philippines announced the tender for the combat-capable aircraft," — told RIA Novosti the Russian delegation. He added that the tender will also attend South Korea. "We hope that our offer will be more profitable," — said the official. Head of the Department of the Air Force, "Rosoboronexport" Sergei Kornev told reporters that in the near future, Bangladesh could get a Russian loan to purchase 12 Yak-130 aircraft and 12 Su-27 fighters. "As far as I know, the loan is approved, within its framework of Bangladesh will be able to choose the number and assembles aircraft. Negotiations are ongoing, but so far no documents have not been signed," — he said. 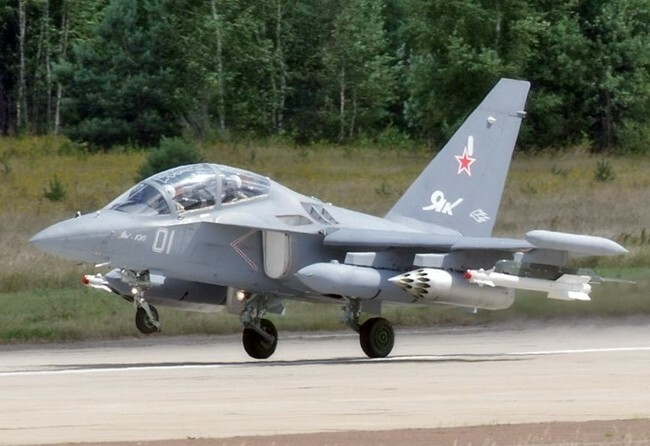 According Kornev option to purchase the Yak-130 Commander interested Bangladeshi Air Force, who visited the Russian stand at Airshow China 2012. The Russian delegation also appreciated the chance to buy the Yak-130 Malaysia and Vietnam. "Malaysia — one of the leading buyers of Russian military aircraft abroad, our equipment is checked there for years, so the chances of acquiring party Yak-130 is high enough," — said the representative of the delegation. He recalled that Vietnam has traditionally focused on the acquisition of Russian weapons, now operate such large contracts, as the construction of six submarines of Project 06361 and supply 12 Su-30MK2. "Teaching and warplanes to Vietnam now very much needed, so it is possible to expect success," — said the official. Yak-130 is designed to "Yakovlev Design Bureau" has been selected basic pilot training aircraft for the Russian Air Force — it allows you to train and upgrade the skills of pilots Russian and foreign military aircraft of the "4 +" and "5". Planes coming in to the Air Force in February 2010, state armaments program for 2011-2020 provides for the purchase of 65 of these machines. In the past year, the corporation "Irkut" has started to export deliveries of Yak-130. The market capacity of these aircraft in the medium term is estimated at 250 pieces. China has already made it clear that bet on their own training and combat aircraft, and does not intend to buy Russian Yak-130. "China with great interest gazed at the new Russian design … but we must honestly admit that our car is not enough prospects in the Chinese market", — told reporters the root. He noted that China is planning to bet on the supersonic, although not necessary for it has its own powerful engine. In the meantime, expect Russia China to sell IL-78 and BE-200. According Kornev, the Chinese Ministry of Forestry has shown interest in the civilian version of the amphibian aircraft Be-200. As for the modernized military transport Il-78MK, it will be offered to China after the completion of testing of the machine, said roots. "We are going to promote it. This aircraft has new engines, new wings, this car has good export prospects, including in China," — he said. Head of the Department of the Air Force, "Rosoboronexport" reminded that China and Russia have signed an agreement to supply China with ten aircraft IL-76, seven of which are repaired in Russia and will soon be transferred to the customer. Overall, the cabin is not brought tangible dividends Russia. The only agreement concluded within the framework of the Russian Airshow China 2012 was a contract on the organization overhaul of aircraft engines in China. The corresponding set of agreements of St Petersburg "Klimov" (part of the United Engine Corporation) signed in Zhuhai, the Chinese company "Tyanli" (China Tanly Aviation). Agreement concerning the organization of the territory of China license overhaul previously supplied to that country aircraft engine development of "Klimov", including the TV3-117 and VK-2500. Amount of the contract were not disclosed. A fly in the ointment in Russian-Chinese relations have recently identified numerous instances of "unfair competition" and, quite simply, the counterfeiting of small arms and armored personnel carriers. As announced in April as part of the armory show DSA-2012 in Malaysia deputy director of "Rooboroneksporta" Nicholas Dimidyuk, there are countries that live by the sale of counterfeit goods — the Chinese have less than she was gone. Dimidyuk noted that some countries in the sale of counterfeit goods are changing tactics and techniques — for example, the sellers did not demonstrate examples of open arms and invite a particular potential buyer for the closed-door talks. m was acute: Russian experts have noted that a number of Eastern European countries still produce products under their own brand names, despite the fact that the intellectual property rights to it belong to Russia as the successor to the Soviet Union. 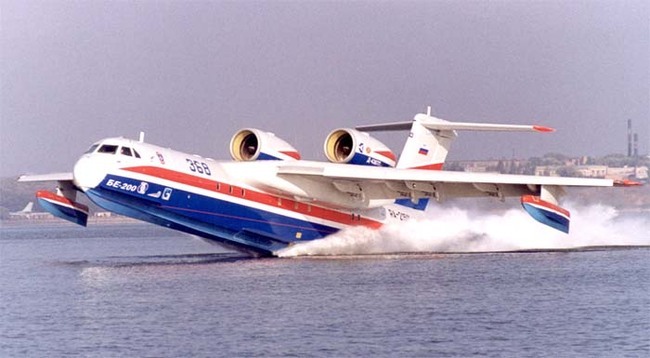 As stated in the Airshow China 2012 Sergey Kornev, Russia hopes to sign an agreement with China on resolving issues related to the unlicensed production of Russian aircraft. He suggested that this would happen at a meeting of the Russian-Chinese intergovernmental commission to be held on November 21 in Beijing. All the necessary documents are prepared. "It is especially true of the Su-27 as the base machine," — said the roots. According to him, in the work of the Commission will attend Defense Minister Sergei Shoigu. In the sky above Zhuhai for four days, performed the famous Russian aerobatic team "Russian Knights". On the Su-27 Russian aces practiced sophisticated programs to rapturous applause and shouts of Chinese viewers. The previous visit "Hero" by the British air show in Farnborough broke down owing to non-compliance with the necessary bureaucratic procedures. After the start of demonstration flights Russian crew almost all the audience and experts, who were at that time in the halls of international exhibitions, ran into the street to watch the flight of Russian aircraft. Commander in Chief of the Russian Air Force, Lieutenant-General Viktor Bondar praised the performance of "Russian Knights" to "excellent." Without the small state of emergency at the show could not have done: Broke one of the five Su-27 fighters aerobatic team "Russian Knights". The breakdown of one of the systems identified after the next landing, and on Thursday stated time up in the air, only four Su-27. 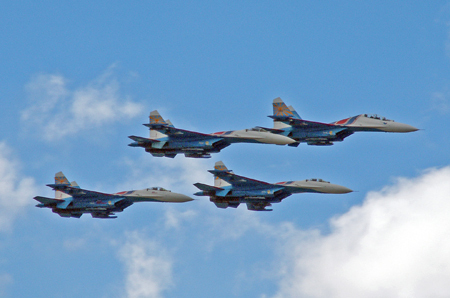 According to the plan, "Russian Knights" should close the air part of Airshow China 2012. Russian Air Force Commander Lt. Gen. Viktor Bondar, talking about plans for the development of pilot groups in Russia, told RIA Novosti that "the decision to establish a new aerobatic team on the Yak-130 yet, but it certainly will." "It will be a completely new aerobatic team on the latest Yak-130", — said Cooper. Responding to a question about whether to change the procurement plans of aircraft, the commander in chief said that "plans for the procurement of equipment for the Russian Air Force will not change."